Belvilla offers an extensive range of authentic, characteristic holiday homes. Belvilla offers 20, 000 holiday homes in 20 European destinations. 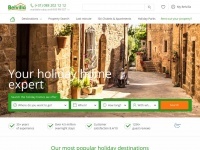 Book your holiday home online!